Dendritic cells (DCs) are the most efficient inducers of all immune responses, and are capable of either inducing productive immunity or maintaining the state of tolerance to self antigens and allergens. In this review, we summarize the emerging literature on DCs, with emphasis on the regulatory function of DCs in allergy and asthma. In particular, we summarize recent data regarding the relationship between DC subsets and TH1, TH2, and regulatory T (TReg) cells. The diverse functions of DCs have been attributed to distinct lineages of DCs, which arise from common immature precursor cells that differentiate in response to specific maturationinducing or local microenvironment conditions. 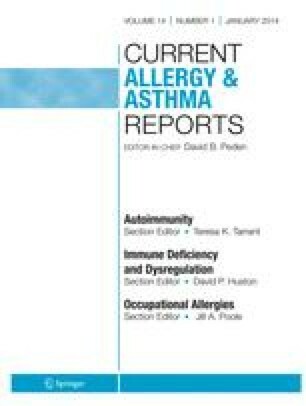 These subsets of DCs induce different lineages of T cells, such as TH1, TH2, and TReg cells, including Th1Reg and Th2Reg cells, which regulate allergic diseases and asthma. Subsets of DCs regulate the induction of a variety of T-cell subtypes, which suppress the development of allergy and asthma, thus providing antiinflammatory responses and protective immunity.